Robin Reineke, When Family Separation is Forever; Boots Riley, "Sorry to Bother You;" Faith Communities: Trump/Pence Must Go! Robin Reineke, Co-Founder and Executive Director of the Colibrí Center for Human Rights, recently wrote, "Families are being separated at the border today, not only by detention practices, but also by death and disappearance. Both are the result of policies designed to inflict maximum suffering. "While trying to defend their inhumane policies of separating families and imprisoning children, several 'Trump administration officials have recently cited “deterrence' as their strategy. For those of us who have been working on the border for a long time, who have found dead bodies on our hikes, and held dry bones in our hands, this language is painfully familiar." We'll talk with Robin Reineke about death on the border, and the government policies behind it. 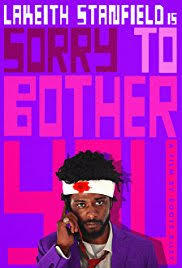 Boots Riley, Director of "Sorry to Bother You"
Boots Riley, Rapper, Producer, Screenwriter and Director, joins us to talk about his recently-released debut film, "Sorry to Bother You." Set in a present-day, dystopian, alternate version of Oakland, California, the film is a hilarious comedy, with terrific acting, and as one reviewer observed, "enough social commentary to fill a dozen comedies." It examines the choices facing particularly Black people today, and the idea that you can make it, but only if you learn to ignore injustice and think only of yourself -- and even then, you face betrayal. Cassius “Cash” Green, played by Lakeith Stanfield, is desperate for a job, and becomes a telemarketer. As he succeeds, he is faced with decisions about the course of his own life, and the fate of many others. I Am My Brother's Keeper: The Trump/Pence Regime Must Go! We'll speak with Rev. Frank Wulf, Pastor of the United Methodist Church in Echo Park, and a member of the Faith Task Force of Refuse Fascism, and Ramona Toliver, also a member of the Faith Task Force of Refuse Fascism, about National Faith Weekend, and a special event in Los Angeles on Sunday, July 15.